Rapt Studio gives Dollar Shave Club’s Marina Del Rey offices a crafty expansion to accommodate its rapid employee growth. Dollar Shave Club was founded on the belief that men can look their best without paying top dollar. Rapt Studio’s objective in expanding the company’s current office space in Marina Del Rey, was to create a holistic design that consolidated separate small offices into one large shared space. The result is a refined workspace reflecting the company’s core values and bringing employees together under one roof to collaborate, unwind, and find the next great shave. The space’s material palette embodies Dollar Shave Club’s commitment to craft. “Squad rooms” function as freestanding rooms with integrated lighting and acoustic baffles. Natural light infiltrates the new Dollar Shave Club’s headquarters in Marina Del Rey. An extensive indoor plant program takes advantage of the great natural light and adds a lot of greenery and life to the space. A spine of common spaces link dedicated programming together. Conference rooms sit near a café and dining space, as well as an apothecary, showroom, and library. The spine also acts as a showcase for physical products, where shelving displays, mirrors, and sinks allow visitors to try the latest products for themselves. Creating functional products that are enjoyable and memorable begins with connection. Here, connection happens throughout the space, including the dining area where people gather, and large garage doors open outside and provide room to relax. A conference room appears to float above the kitchen. Rapt built “squad rooms” as custom furniture pieces (built by MASH studios) that function as freestanding rooms with integrated lighting and acoustic baffles. These rooms expand to delineate the main circulation axis as pass-throughs that then create planters/banquettes in the main dining area. 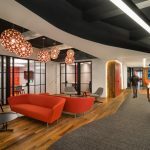 In addition to the delineation along the main axis, creating a spatial buffer between the circulation and work areas, they also serve as informal meeting rooms or project rooms for teams. In addition, the office space’s material palette embodies Dollar Shave Club’s commitment to craft with raw and exposed workshop materials, while departmental and common spaces feeling more industrial. Wayfinding, graphics, and art combined with jungle wall coverings and a vast plant program to paint a picture of the club’s story throughout the space. The kitchen provides employees a space to congregate. The “apothecary” features a fully functional barber station for haircuts/shaves, product display, and testing. The office space accommodates the company’s growth and employee expansion. What technology products were used? The speaker system installed provided ambient music along the main circulation. The “apothecary” features a fully functional barber station for haircuts and shaves, product displays, and testing. The in-house barber shop offers employees the chance to test new products and get their next great shave.